Kayt McCasey saw the Certificate in Sales Excellence program would give her the ability to thrive doing things she loved. McLeod helps students grow in the program by making connections with mentors. She knows it is particularly important for the female students who have less opportunities to interact with other women in the program. Laura McLeod (far right) works to provide networking opportunities for women in the sales program to find professional mentors. “What I try to do is connect students with highly successful women in sales to show them how fun, smart and productive they can be in the profession. A lot of companies are interested in hiring women in sales, and we have a lot of successful alumnae and sales leaders at our partner companies,” she said. Kayt McCasey, a senior marketing and management major from Burnsville, Minnesota, got her foot in the sales program after taking Sales Communication (MRKT 257), the required course for students wanting to earn a certificate in professional selling. She learned sales is a driving force behind the marketing industry. She also saw it would give her the ability to thrive doing things she loved. McLeod helped connect McCasey with an internship last summer at Polaris Industries in the Minneapolis-St.Paul area. She mentored with marketing specialist Nikki Nielson. “Nikki is about five years older than me and helped me immensely. I’ve constantly gone back to talk to her through the school year. She helps show me how to transition into the profession by handling interviews appropriately, teaching me what to say, how to word things and giving me a role model of what might be expected,” she said. Although initially hesitant to make a commitment to the sales program because of her other academic commitments, McCasey thinks she made the right decision. “The sales program offers all the things I wanted to learn such as customer relationship management, software and data knowledge to understand customers better and how to make meaningful connections. I’m thankful Professor McLeod is one of my professors as she’s been successful in the industry, and sees potential for women in the industry to become leaders among sales professionals. That gives us hope to follow in her footsteps,” said McCasey. McLeod hopes more women follow in McCasey’s footsteps and work toward earning a certificate in professional selling. 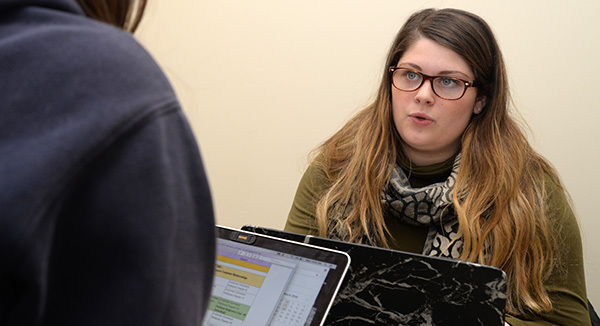 She sees the program as beneficial to all majors, whether students are in business or not. “Sales has changed and everyone sells now. If you want to be a partner in a law firm, you’re going to be selling. If you’re working in an accounting firm or a physician talking to your patient, the ability to persuade is a good skill regardless of your career. You’ll always be selling,” said McLeod. To learn more about the Center for Sales Excellence, visit: business.unl.edu/sales.